--There is no female mind. The brain is not an organ of gender. As well speak of a female liver. To "let" a house means to rent a house. 2. Do you think one should expect that in marriage? Why or why not? 3. What does it mean to be practical? 4. What does John do for a living? 5. What does it mean to be "of high standing"? 6. If you disagreed with your doctor, what would you do? 7. What does it mean to do something "in spite" of someone? 8. What do you think her "condition" is? Is she sick? What kind of sick? 9. How does John feel about things that are strange--"things not to be felt"? 10. When does she mostly "control" herself? 12. Would you like having a scheduled "prescription for each hour in the day"? 13. Why do the windows have bars on them? 15. Why do you think John hates to have her write? 16. What does the word "atrocious" mean? 17. Why do you think John doesn't want her to be with her baby? 18. Why wouldn't John have the room repainted or re-papered? 19. He said he would, but did he? A whim is something you want but is not really necessary. 20. Do you think a wife should ever make a husband uncomfortable just for a whim? Out of one window I can see the garden, those mysterious deep shaded arbors, the riotous old-fashioned flowers, and bushes and gnarly trees. 21. What does she think would help her? 22. Why do you think she sees such awful things in the pattern? The wallpaper, as I said before, is torn off in spots, and it sticketh closer than a brother--they must have had perseverance as well as hatred. 23. Do you think the woman telling the story is a "perfect and enthusiastic housekeeper"? This wallpaper has a kind of sub-pattern in a, different shade, a particularly irritating one, for you can only see it in certain lights, and not clearly then. 24. What does she see skulking in the wallpaper? 25. In your opinion, does John love her? Why or why not? 26. Why is it for "my sake and for our child's sake"? And that cultivates deceit, for I don't tell them I'm awake--Oh no! 27. What does it mean to be paranoid? John is so pleased to see me improve! 28 Is she improving? Why do you think she is or isn't? He laughed a little the other day, and said I seemed to be flourishing in spite of my wallpaper. 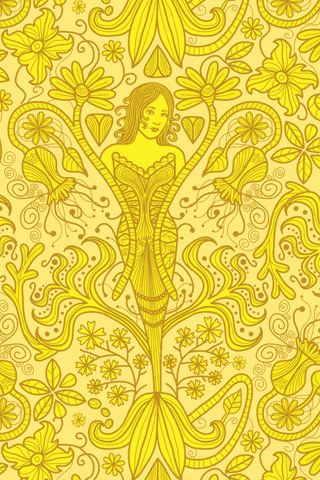 It is the strangest yellow, that wallpaper! It makes me think of all the yellow things I ever saw--not beautiful ones like buttercups, but old foul, bad yellow things. 29. How does she describe the wallpaper now? 30. What has she discovered? 31. What delusions is she having?